Protect your capital investments with this super effective plant and formwork protector. 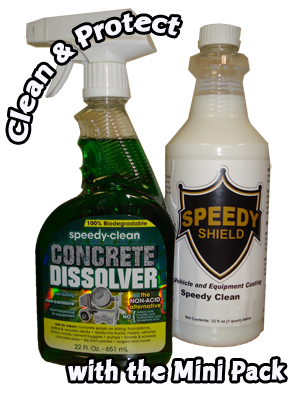 Speedy Shield is formulated to prevent concrete and other cementitious materials from adhering to concrete mixers, equipment and tools. Speedy Shield is biodegradable, non-flammable, non-corrosive, and won’t harm paint. Apply undiluted with our Chapin sprayers on a fine 'mist' nozzle setting over entire surface to be treated. Spray or pour into concrete mixer drum and allow to dry prior to adding concrete for best results. Dip hand tools into Speedy Shield to prevent concrete build-up. Must be applied undiluted to dry surface. DO NOT FREEZE. Always wear rubber gloves and eye shield to apply.